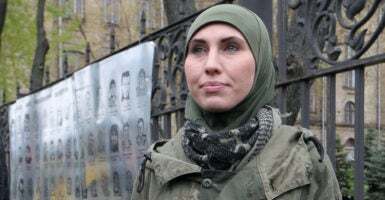 KYIV, Ukraine—A Chechen woman who had fought on the side of Ukrainian forces against Russia and its separatist proxies in eastern Ukraine died in a brazen vehicular ambush on the outskirts of Kyiv on Monday. The ambush underscored what some Ukrainian government officials and security analysts suspect is part of a larger Russian shadow war intended to destabilize the country. “It looks very much like an ongoing shadow war conducted by Russian intelligence,” Taras Berezovets, founder of the Ukrainian Institute for the Future, a Kyiv-based defense think tank, told The Daily Signal. Amina Okueva— who served as a combat medic and press officer with Ukraine’s Kyiv-2 police battalion—was killed during an attack at a railroad crossing about 16 miles outside of Kyiv’s city center, and more than 400 miles distant from the front lines in Ukraine’s embattled southeastern Donbas region. Okueva’s husband, Adam Osmayev, was in the car during the ambush; he survived the attack and is currently being treated in a Kyiv hospital. Osmayev is the former commander of the Dzhohar Dudaev peacekeeping battalion—a volunteer pro-Ukrainian military unit that is named after the late Chechen rebel leader who led an insurgency against Russian forces in the 1990s. Ukrainian security officials immediately blamed Moscow for orchestrating Okueva’s assassination as part of Russia’s ongoing hybrid war against Ukraine. “Russia, continuing its aggression in eastern Ukraine, has unleashed terror deep behind the lines, killing courageous defenders of our country,” Oleksandr Turchynov, head of Ukraine’s National Security and Defense Council, wrote on Facebook. Security officials in Kyiv have been on edge after a string of brazen assassinations in the city during the past year, which have targeted soldiers, journalists, and lawmakers. That editorial was a reaction to a bombing in central Kyiv on Oct. 26. A bomb hidden in a scooter detonated as Ihor Mosiychuk, a Ukrainian member of Parliament, left the downtown studio of the Ukrainian news channel Espreso TV. Mosiychuk survived, but his bodyguard and a passerby were killed in the blast. While Russia is generally considered the most likely culprit for the recent assassinations in Kyiv, some Ukrainian security experts caution authorities against ruling out other possibilities. “Given the ongoing conflict with Russia in Donbas and especially the current state of stalemate, it’s natural to imply that Moscow is the mastermind behind all those incidents,” Mykola Bielieskov, a defense analyst at the Institute of World Policy, a Ukrainian think tank, told The Daily Signal. Bielieskov said the recent violence in Kyiv was too narrowly targeted to force Kyiv to make any political concessions to Moscow. “Even if in at least some cases the Kremlin was behind [the attacks in 2017], it’s very difficult to imagine how they can force Ukrainian authorities to make political concessions toward Russia,” Bielieskov said. Oleksiy Melnyk, co-director at the Razumkov Centre, a Ukrainian think tank, also took a measured approach toward casting blame on Russia without concrete evidence. “Most probably [think] the latest attack was initiated and conducted by some agents close to the Russian special services or the ethnicity of the victims should be a hint for investigators,” Melnyk said, referring to the ambush that killed Okueva. Russian authorities accused Osmayev of an attempted assassination of Russian President Vladimir Putin in 2012. A Russian court charged Osmayev in absentia, but he remained in Ukraine where he fought in the country’s ongoing war against Russia and its separatist proxies in the eastern Donbas region. Osmayev and Okueva had previously survived a June 1 assassination attempt by a Chechen-born Russian citizen who pretended to be a journalist for the French newspaper Le Monde. 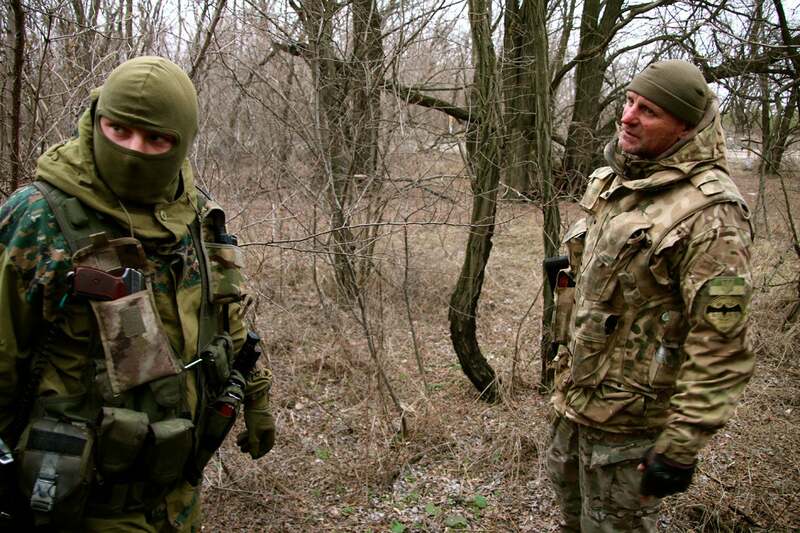 Russia’s proxy conflict in eastern Ukraine has become a trench warfare stalemate. Ukrainian media later reported the would-be assassin, Artur Denisultanov-Kurmakaev, had ties to Ramzan Kadyrov, head of the Chechen Republic and an ally of Putin. Ukrainian security officials suggested Kadyrov might also be tied to last week’s assassination attempt on Mosiychuk, the Ukrainian member of Parliament. “There is only one customer and it is Russia,” Ivan Varchenko, adviser to the head of the Ukrainian Ministry of Internal Affairs, told 112 Ukraine, a Ukrainian news network, in reference to the Oct. 26 bombing. For his part, Kadyrov said Ukrainian officials were blaming him to deflect attention from political turmoil within Ukraine, according to Russian news reports. In April 2014, Russia launched a proxy political war in eastern Ukraine’s Donbas region that escalated into a conventional military conflict, which is ongoing. 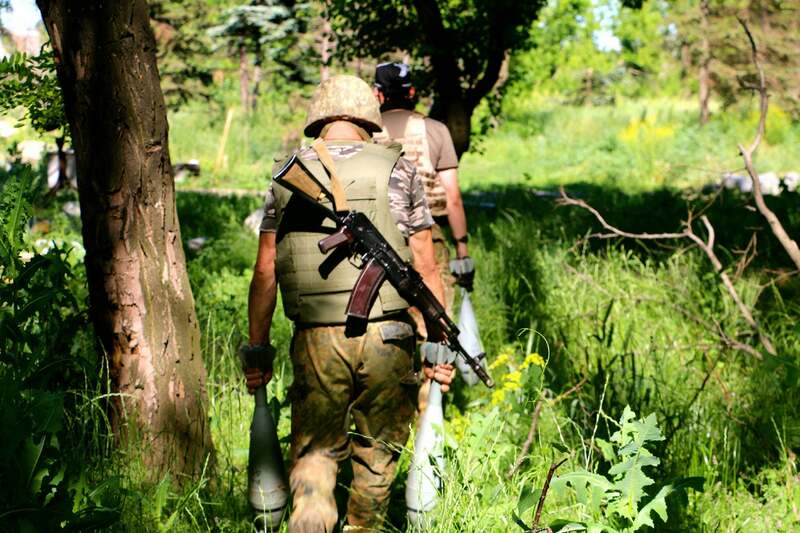 So far, more than 10,100 Ukrainians have died in the fighting. Since the February 2015 cease-fire deal, known as Minsk II, went into effect, Russia’s proxy war in eastern Ukraine has been geographically quarantined to a 250-mile-long front line in the Donbas region. Consequently, since Minsk II, the war’s lethal, physical effects have largely been confined within the range of the weapons used. Yet, with the conflict now frozen in a static, trench warfare stalemate, some experts say the Kremlin could change course and increasingly look to destabilize Ukraine by other means, including cyberattacks, propaganda, sabotage, and assassinations—all of which have already been used as part of Russia’s “hybrid war” against Ukraine. 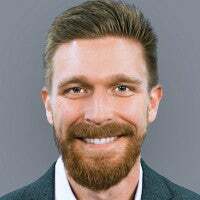 “Assassinations, kidnappings, subversions, cyberattacks, et cetera, have been there for more than three years,” Melnyk told The Daily Signal. More than 10,100 Ukrainians have died in Russia’s proxy war in the country’s eastern Donbas region, which began in April 2014. On Sept. 8, a Chechen with Georgian citizenship named Ali Timayev, also known as Timur Mahauri, died in a car bomb explosion while driving his black Toyota Camry through one of Kyiv’s busiest thoroughfares, Bessarabska Square. Timayev, 39, reportedly fled Chechnya after fighting against Russian forces in the Russian-Chechen wars. 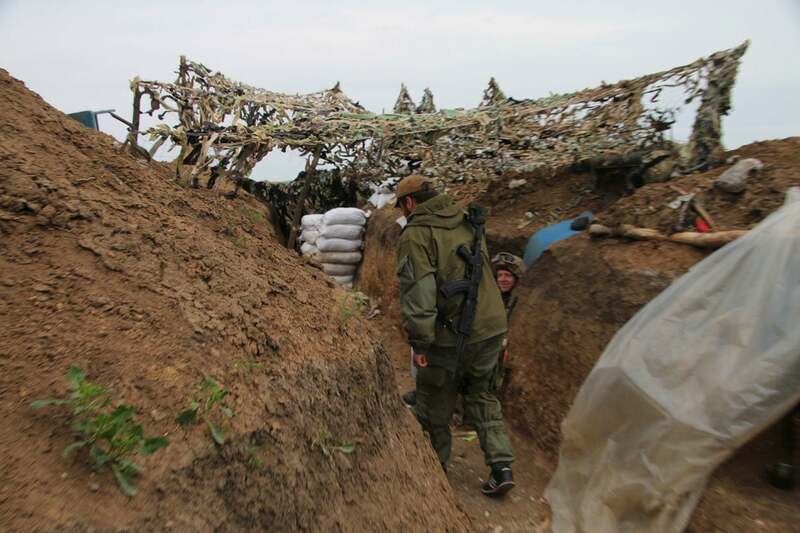 He saw combat in the conflict in eastern Ukraine as part of a pro-Ukrainian Chechen volunteer battalion called the Battalion of Sheikh Mansur. “We don’t know so far if Okueva’s assassination was done by Russians but it looks connected to Timur Mahauri’s car bombing,” Berezovets said. On March 23, former Russian parliamentarian Denis Voronenkov, a Putin critic who fled to Ukraine in 2016, was shot dead as he was leaving the Premier Palace Hotel in central Kyiv. The broad daylight assassination of the exiled Russian lawmaker in central Kyiv happened only hours after a massive explosion at a military ammunition depot in the town of Balaklia in northeastern Ukraine, which forced 20,000 people to evacuate. “Once again we see a textbook method of the Russian special forces,” Ukrainian President Petro Poroshenko said in a statement at the time. And on June 27, a car bomb in Kyiv killed Col. Maksym Shapoval, a Ukrainian special operations commander. That same day, a computer virus that had been incubating for months in the network of a Kyiv-based tax software company paralyzed Ukrainian banks, communications, media sites, government networks, and mass transit systems. The cyberattack, which security experts called Petya, spread throughout the world. “It’s no accident that the terrorist act coincided with a massive cyberattack, which also has a Russian trace,” Turchynov, head of Ukraine’s National Security and Defense Council said at the time. In a similar sequence of events, on Oct. 23, three days prior to the assassination attempt on Mosiychuk, cyberattacks struck Kyiv’s metro and the Odesa airport. Ukrainian security officials said the cyberattacks originated from Russia. Journalists have also been swept up in the wave of violence to hit Ukraine’s capital city. On July 20, 2016, Pavlo Sheremet, a well-known investigative journalist in Ukraine for the news agency Ukrainska Pravda, died from a car bomb. Sheremet’s car exploded in front of a McDonald’s restaurant in central Kyiv, near the National Opera of Ukraine. Weeks later, on Aug. 28, 2016, Russian journalist Alexander Shchetinin was found dead on the balcony of his Kyiv apartment due to what police said was a gunshot wound to the head. He was discovered by friends who had come to celebrate his birthday. Shchetinin had renounced his Russian citizenship to become a Ukrainian citizen and was the founder of the Kyiv-based New Region news agency. Russia, for its part, says it has nothing to do with any of the aforementioned attacks. The Kremlin points to the violence playing out on Kyiv’s streets as evidence of the country’s lawlessness and political instability. “The inability of Security Service of Ukraine to prevent at least some of these assassinations and explosions will play to the hand of Russia, which can present Ukraine as a failed state where even in its capital you can’t be secure,” Bielieskov, the Ukrainian defense analyst, said.